So just who is the courageous soul who saw an opportunity, took a risk and starting this incredible thing we call Living Green Walls? None other than our very own resident Green Guy, Sean O’Connor. We managed to grab a few minutes with him to find out a bit more about the man behind the gorgeous green pieces we design and install. Hailing from the beautiful plains of Zimbabwe, Sean moved to Cape Town in 2004 to pursue his love for design. Several years of studying equipped him with the technical knowledge he needed to translate his love for nature and passion for beauty into living art pieces. Sean worked at a small architectural firm for a number of years, after which he moved on to a local landscaping firm where he used his drawing and design skills to create gorgeous gardens and transform open spaces into inviting areas for entertainment and relaxation. Sean quickly realised that the rapid rate of urbanisation was limiting clients from being able to enjoy green spaces in their homes and places of work. Apartment living and air-conditioned offices did not offer the needed respite that nature tends to offer. 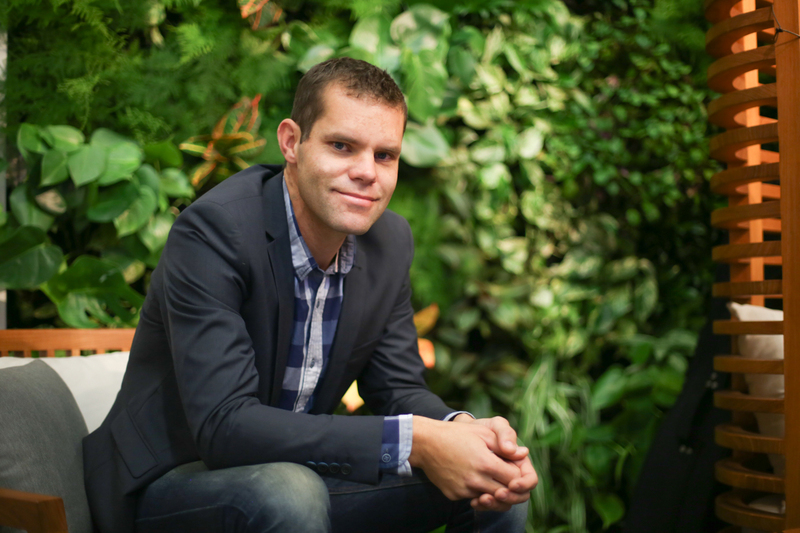 Sean’s restorative nature was instantly drawn to doing something about it – to find a way to bring the outdoors indoors in a way that could not only increase productivity and morale, but contribute to the ‘going green’ movement in order to save our planet. Here at Living Green Walls, Sean is affectionately known as our resident Green Guy, not only because he is the mastermind behind the beautiful designs he creates, but because of his desire to be in nature. Sean is happiest when he is in the middle of nowhere, surrounded by majestic mountains and an array of grasses. When he is not hiking up a mountain or cycling around the Peninsula, Sean loves spending time with his wife and their two dogs. He is a self-proclaimed coffee-snob and craft-beer enthusiast and enjoys finding hidden gems in the Mother City that offer just that. He is passionate about life and building into this great country, which makes him one of the most inspiring people to work for and with. With his drive, vision and obscure love for plants, we are so excited to see where our Green Guy takes us next!